A simple design, but an incredibly powerful look composed of exceptional quality Diamonds. 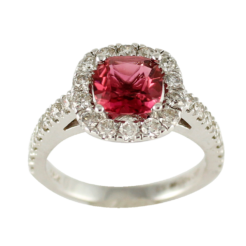 The center Diamond is 0.90ct and is “G” in color and “SI-1” in clarity. The center Diamond is complimented by 0.20ct total weight of full cut Diamonds set in 14kt White gold. This is a classic look that will never go out of style.